What blood pressure is normal? What makes high blood pressure worse? Systolic pressure – this is the highest pressure that is exerted by the heart contracting and pumping out the blood, when it beats. Diastolic pressure – this is the lowest pressure when the heart is at the resting phase of the cycle, and is resting between beats. In a normal fit and healthy adult the blood pressure would be approximately 120/80 mm Hg. This figure can alter in response to age, disease, stress and medication. When expressed verbally it is “120 over 80”. If either of the numbers is higher than the normal you have high blood pressure. If your Blood pressure on consecutive measurements is in the category of 140/90 you will require treatment – this maybe lifestyle changes or medical treatment. If you have diabetes or suffer from kidney problems, or have experienced either a heart attack or a stroke your blood pressure should be not above130/80. In the majority of people the cause for high blood pressure is unknown, and this is known as primary high blood pressure. In others there is a reason for the high blood pressure and this may be due to the medicine they are taking for a medical illness, this is called secondary high blood pressure. High blood pressure has been called the “silent killer” as it is responsible for increasing your risk of heart attack, strokes and heart failure. Over 15million people are affected by this condition in the United Kingdom alone. Heart attack - arteries carry oxygen in the blood to the heart muscle. If the heart is under pressure and the arteries become narrowed blood is unable to flow easily it causes chest pain, known as "angina,” If the flow of blood is blocked the result can be a heart attack. Stroke- High blood pressure can cause the small blood vessels in the brain the bleed or indeed cause a clot to block off an area to the brain completely causing a major stroke. Eyes – high blood pressure can cause the tiny vessels in the eye to bleed leading to weakened vision and if untreated blindness. Kidneys – If the kidneys are subjected to high blood pressure the vessels adjoining it become narrow consequently less is being filtered, waste products build up and if left untreated lead to kidney failure. The bottom line is there aren’t any symptoms unless your blood pressure is very severe in which case you may suffer from headaches, shortness of breath, dizziness and visual disturbances. 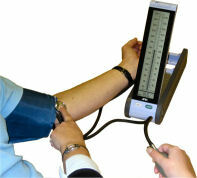 Often it is found that you may have high blood pressure on a routine check at your doctors. If you have members of your family who already suffer from high blood pressure there is an increased risk. If you are overweight, smoke, don’t exercise and have a high level of alcohol intake you are increasing your risks with each of those. Other illnesses like diabetes and kidney disease can also be a factor. Looking after you seems easy to say, and yet there are some quite easy ways of helping ourselves without medication to actually improve our lifestyle, and our blood pressure. Loosing weight- large portions are a big problem with our eating habits. Eating less and healthier food can noticeably improve energy levels. Taking regular exercise- short bursts of exercise of 20 mins a day can dramatically improve your fitness levels. Eating well- eating at least 5 portions of fruit or vegetables every day, can have a very beneficial effect on your overall health. Reducing salt intake- Not adding salt to the food and using herbs to flavour is an option to consider, as well as many other reduced salt products on today’s supermarket shelves. Stop smoking -this is probably easier said than done but it is a major factor in not only high blood pressure but cancer as well. There are many people out there who are able and willing to help you but the first step needs to be taken by you. Limiting your alcohol intake - 2-3 units daily for women and 3-4 units for men this doesn’t mean this should be consumed everyday! If you happen to be taking a drink then this is the government recommended total to be consumed. Recommendations from Alcohol Concern suggest having at least two days free of alcohol a week with a reduction in the amount we consume the older we become. This is an electronic device which at intervals measures your blood pressure over a typical 24 hour period to evaluate your blood pressure. This means that the doctor treating you will have an accurate record of times during daily activities when your blood pressure is raised. Getting the best blood pressure results. Don’t arrive in the surgery stressed and in a rush – allow yourself time to sit and relax for at least 10 mins before the test. Wear comfortable clothing that allows easy access to your arm. Make sure you have an empty bladder so you are comfortable. Don’t drink caffeine drinks tea/ coffee or alcohol before the test. Low blood pressure is usually to be worried about when it is sudden or when accompanied with other symptoms such as dizziness, fainting, difficulty with vision, rapid breathing, pale and clammy skin or exhaustion. Severely low blood pressure can be potentially very serious as lack of circulating oxygen to vital organs can be life threatening.